Much of a muchness again this week, with a very familiar (and rather sparse) selection of rare and scarce birds at large across Britain and Ireland. New arrivals were at a premium once more, although there was an intriguing report of not one but two Pacific Divers off Newlyn, Cornwall, on 4th; elsewhere in the county, the regular adult also remained off Pendower Beach on 30th and a fourth continued off Crookhaven, Co Cork. In fact, Pacific Divers seem almost as numerous as White-billed Divers in winter these days. A juvenile White-billed off Easter Skeld, Shetland, from 2nd was one of two in the isles, the other concerning the regular adult off Kirkabister. In the Outer Hebrides, another continued off the north-east coast of Barra, while back on Shetland, the Pied-billed Grebe was still in residence at Loch of Spiggie. Far to the south, a Black-throated Diver at Frimley Gravel Pits, Surrey, on 2nd relocated across the county to Mercers Country Park from 3rd. 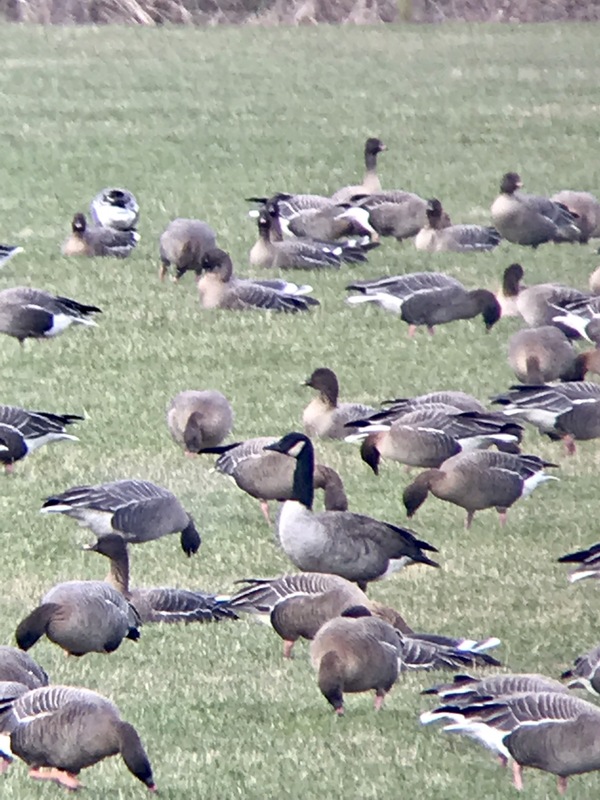 It appears from photos that this is the same bird seen at Sevenoaks Wildfowl Reserve, Kent, in late January and previously at Chatham docks in December 2018. Black-throated Diver, Frimley GPs, Surrey (David Carlsson). The Black Scoter continued off the Northumberland coast between Holy Island and Goswick, while the King Eider remained on the Dovey Estuary, Ceredigion. A dozen sites held Ring-necked Duck, including a peak count of seven at Lough Atarriff, while two drake Lesser Scaup were seen either side of the North Channel, with last week's bird still at Loch Ryan, Dumfries & Galloway, on 30th, the same day another was found at Dargan Bay, Co Antrim. It's never easy to ascertain which Ferruginous Duck is wild and which isn't but the fact that a drake at Lee Valley Country Park, Herts, on 5th was unringed was likely a good sign. Elsewhere, the regular drake remained at Blashford Lakes, Hants, and reintroduced birds were in West Sussex and Berkshire. Just two American Wigeon were logged this week – the drake at Tain, Highland, and the female at Grimley, Worcs. Eight Green-winged Teal were seen, while there were seven Surf Scoter, three Black Brant, four Snow Geese, Todd's Canada Geese in Lancashire and on Islay and Cackling Geese on Islay and North Uist. Todd's Canada Goose, Lytham Moss, Lancashire (Rob Creek). A second Spotted Sandpiper was found in south-east Ireland, with a bird on the River Brickey near Dungarvan, Co Waterford, from 30th in addition to the wintering bird at Ferrybank, Co Wexford. Lesser Yellowlegs remained on show in Cornwall and Dorset, the former county also holding on to the Temminck's Stint at Chapel Amble. In Lincolnshire, the Long-billed Dowitcher was still at Frampton Marsh on 5th. Spotted Sandpiper, Killongford, Waterford (Andrew Malcolm). In the Channel Islands, the American Royal Tern continued to hug the coast of Guernsey, last being reported on Pembroke Beach on 5th. The Forster's Tern seems fairly reliable on the north side of Galway Bay at the moment, being seen by Mutton Island on 2nd and 4th. However, the Bonaparte's Gull at Erith Pier, London, continues to be fairly hit and miss, reappearing on 31st and 2-3rd, albeit with no sign on 4-5th. Bonaparte's Gull, Erith, London (Jamie Partridge). Five Ring-billed Gulls were noted in Ireland, all referring to regularly returning adults, while Britain claimed four, these including a brief first-winter at Trent Port Wetlands, Lincs, on 5th. Only 25 sites scored Caspian Gulls, most of which were in central and eastern England, the exception being the continuing second-winter at Hayle Estuary, Cornwall. Iceland Gull numbers tallied around 45, with Glaucous Gulls marginally less numerous. Ring-billed Gull, Sandaig, Tiree, Argyll (John Bowler). Glaucous Gull, Cley Marshes NWT, Norfolk (Mark Wilson). Curiously, the Black-throated Thrush was again reported 'recently' from a garden in Bishopstone, Wilts, although a potential twitch nonetheless still seems a long way off. On Scilly, the Eastern Yellow Wagtail continues to pop up on St Mary's with regularity, with the last sighting coming on 3rd. The Dusky Warbler saw off the freezing conditions of the first half of the week, lingering at Huttoft Bank, Lincs, to at least 3rd and often showing very well. Sewage works were the place to hunt for Pallas's Warblers, with a surprising find concerning that at Fishburn, Durham, on 31st, where it lingered until the week's end. Elsewhere, the Cornish bird lingered at the water treatment plant at Coverack. A total of 18 sites held Yellow-browed Warblers, with birds as far east as West Molesey, Surrey, and north to Cwm yr Eglwys, Pembs. The Hume's Leaf Warbler at Newhaven, East Sussex, wasn't seen beyond 30th, while the Blyth's Reed Warbler at Hope Carr, Greater Manchester, lasted to 4th. Dusky Warbler, Huttoft Bank, Lincolnshire (Russell Hayes). Pallas's Warbler, Fishburn, Durham (Martyn Sidwell). Yellow-browed Warbler, Molesey Heath, Surrey (Dave Harris). A couple of new Coues's Arctic Redpolls were found, including a very probable bird at Edlingham, Northumberland, on 1st and another photographed at Swaddywell Pit, Cambs, on 2nd (though not identified until 4th). Coues's Arctic Redpoll, Swaddywell Pit NR, Cambridgeshire (Sarah Lambert). Two Rosy Starlings remained, the most regularly reported of which was that in Llandudno, Conwy; the East Sussex bird was last noted in Seaford on 30th. The Richard's Pipit was again at Kingston Seymour, Somerset, on 5th, while a total of 11 Great Grey Shrikes were dotted around England. The Common Rosefinch at Cunningsburgh, Shetland, toughed out the bleak winter conditions to 30th. Finally, a couple of Little Buntings were seen this week: one was at Weybourne, Norfolk, from 30-2nd and another was at an undisclosed Breckland site. Little Bunting, Weybourne, Norfolk (Moss Taylor). A returning adult American Herring Gull was near Muxía, Galicia, Spain. In France, a first-winter Forster's Tern drew admirers to Noirmoutier Island – having been found on 20 January, it was still there this week. Forster's Tern, Noirmoutier-en-l'Île, Vendée (Hugo Touzé). The Belgian Pygmy Cormorant and the Dutch Oriental Turtle Dove and Nutcracker combination remained at their favoured localities, while across the border in Germany a male Pine Bunting was at Lachem, Lower Saxony, on 31-1st. Pine Bunting, Hessisch Oldendorf, Lower Saxony (Armin Kreusel). Swedish records concerned the lingering Oriental Turtle Dove at Gullbrandstorp and the Eastern Imperial Eagle near Skurup. In south-west Iceland, the White-throated Sparrow remained at Kópavogur, while the American White-winged Scoter was, as ever, present among Common Eider at Keflavík. White-throated Sparrow, Kópavogur, Höfuðborgarsvæði (Óskar Andri). Long-staying Afrotropical vagrants included the African Crake on Sal, Cape Verde, and the Dwarf Bittern on Fuerteventura, Canary Islands. However, all the recent Allen's Gallinules appear to have moved on. Meanwhile, across the other side of the dry expanse of North Africa, three Crested Honey Buzzards remained at Eilat, Israel.